While most rooms in a home tend to collect clutter, one room more than others can quickly become filled with clutter if you don't take control... your bedroom! While most rooms in the home tend to collect clutter, one room more than others can quickly become filled with clutter if you don't take control... and that's your bedroom! A bedroom is supposed to be a calm retreat, the one place in your home that you want to escape to at the end of each day. But a bedroom filled with clutter is the last space you want to spend time in when all you want to do is tidy up. A once a month routine will soon get rid of excess clutter and we take a look at some areas in the bedroom that you might want to pay more attention to. 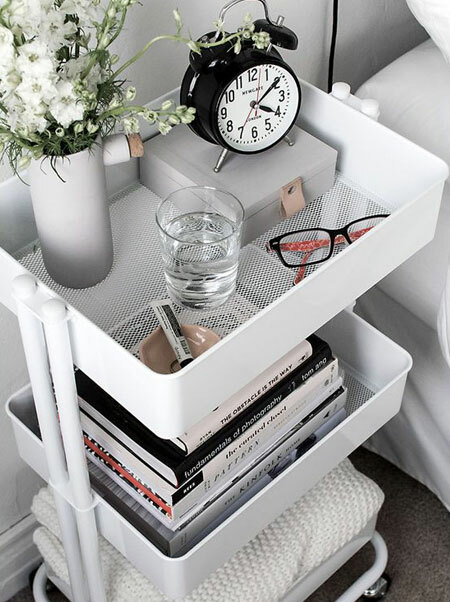 Your bedside tables or nightstands are a space where you can have a few items of display, or perhaps place a book or two for nighttime reading. 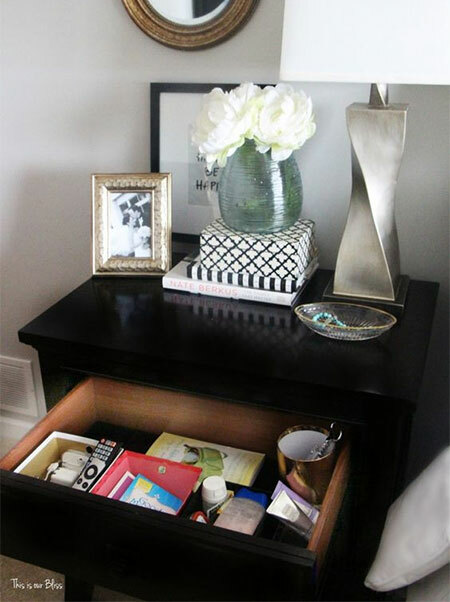 But it's so easy to build up clutter on your bedside tables that leave little room for much else. If your bedside tables are looking overloaded with clutter, it's probably time to sort out what shouldn't be there. Set aside an hour or two to go through your bedside cupboards and sort through what can be put away or that belongs somewhere else. 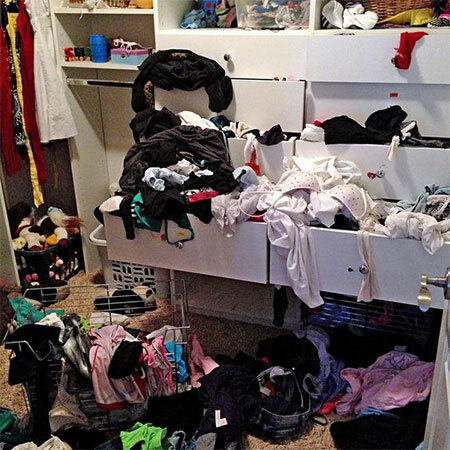 Drawers are the first place to start, as these are usually filled with all types of unnecessary items that get dumped in there for lack of finding another spot. 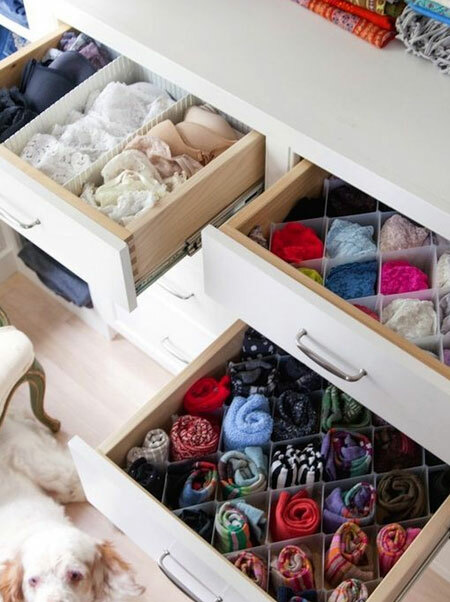 If there are items in your drawers that you simply cannot live without, look at making drawer dividers to make your drawers an organised place. Try to limit what's on top of your bedside table to only what you really need and pack away everything else that is taking up space. If you find that you have too much stuff that needs to fit into your bedside cabinet, perhaps it's time to look at something else that will work for beside the bed. You don't have to stick to a specific style since nowadays almost any storage cabinet can be repurposed to serve as a bedside storage cabinet and table. 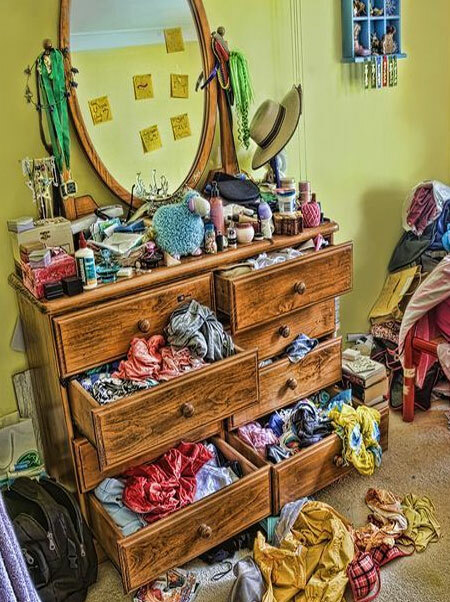 If you don't already have an organisation system in place for your bedroom storage, you will see that it doesn't take long for drawers and cupboard to become a mess. Even a simple organisation system will help you to control the chaos, not just in a chest of drawers but for all your bedroom storage. When drawers are overflowing with 'stuff' it makes it difficult to find anything you might be looking for and you will probably end up making more mess. 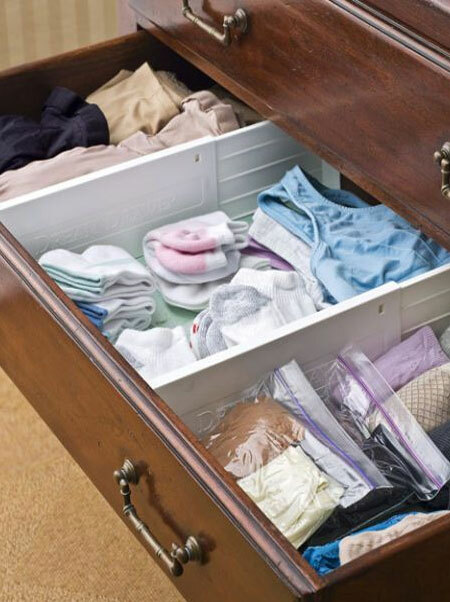 A simple system using drawer dividers or plastic containers is an inexpensive way to keep your drawers organised and you just have to stick to the method to keep your drawers organised. 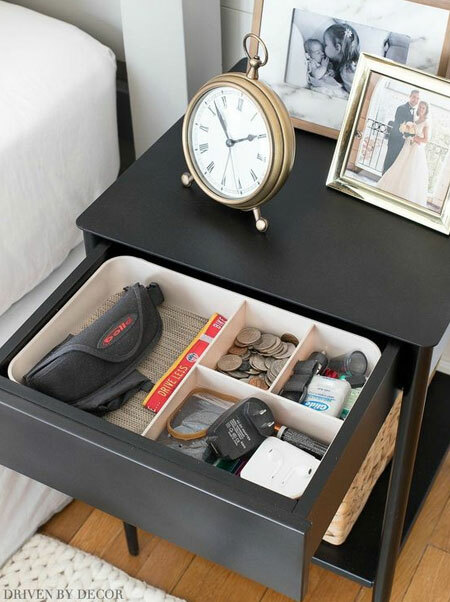 It is easy to make your own drawer dividers using materials you probably already have at home. Plastic file folders are just one way to make a simple drawer divider, similar to that shown above. Use a glue gun to secure individual strips of plastic together to make a honeycomb design drawer organiser.